The copperhead (Agkistrodon contortrix) snake is a venomous snake found throughout North America. 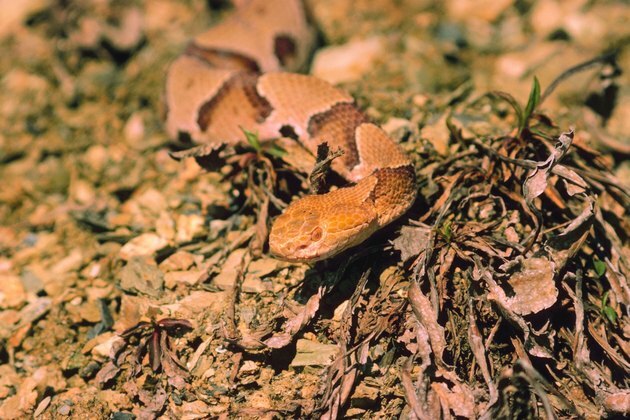 The North Carolina Cooperative Extension notes that the copperhead accounts for more snake bites in the United States each year than any other U.S. species. Copperheads have the mildest venom of all North American venomous snakes, according to the Warnell School of Forest Resources. Their bite is rarely fatal but does require immediate medical attention. Copperhead babies are easily recognized by their yellow-green tails. Copperheads live near creeks and rivers, under shrubs and vegetation, in wood piles, in gardens, sheds and under porches and decks. Baby copperheads are not more dangerous or venomous than adults, but their small size makes them hard to see and can attract children and pets, states The Missouri Department of Conservation. A female copperhead can give birth to up to 18 live babies. Clean the area around your home. Wear thick gloves, loose jeans or coveralls, and thick boots while removing rubbish, wood piles, fallen trees or logs. Remove any items stored under your porch or deck. These are hiding places for copperheads and additional items will only make it harder to see them. Use a shovel -- not your hands or feet -- to pull things out from under decks and porches. Mow the lawn often. Short grass and well controlled vegetation will make your yard less appealing to copperheads. Apply or place a repellent in your yard and near your home. Chemical repellents are usually sprayed or sprinkled in the infested area and last around three months. These repellents use a snake's sense of smell to deter it but use caution where children and pets will be present. Electronic repellents, a more expensive option, can be placed in a problem area and produce a 45-foot radius ground vibration. Snakes pick up the vibration through their bodies, perceive it as a threat and leave the area. Electronic repellents that use solar power can last over a year. Can Chipmunks Damage My House?